I’ve never been fond of heights. I remember refusing to sit anywhere but on the floor in the middle of our Ferris Wheel car in Niagara Falls at a young age. In 8th grade, I practically had a nervous breakdown on our class rock climbing trip when I stood roped and harnessed at the top of a 150-foot cliff and had to lean backwards over the edge to rappel down. In my adult life, not much has changed between me and heights. When J and I rode the Ferris Wheel in Paris last summer, I was nervous (although I did sit in my assigned seat for the entire ride). When we stood at the top of the aptly named “Jump Off” in The Smokies two months ago, I couldn’t wait to continue our hike a bit further from the edge. Today, I pushed the limits of my fears and tackled some challenging trails in Acadia National Park. The park has two “hiking” trails that are often referred to as “technical rock climbing without the ropes.” These trails are The Precipice (a 0.9 mile trail that basically scales the side of an 930-foot cliff) and The Beehive (a slightly smaller cliff at 0.6 miles and 520 feet). This time of year The Precipice is closed due to peregrine falcon nesting season (sweet! ), but The Beehive is open. J was excited for the hike, and after watching several YouTube videos and online reviews (that didn’t help much), I reluctantly agreed to make the trip. While we lingered over coffee at the B&B this morning, we looked at our pocket hiking guidebook (purchased for a mere $3.50 at our local coffee/used bookstore, Crackskulls) and planned a hike that would bring us up The Beehive, across two miles of ridgeline to the summit of Champlain Mountain, and down over Huguenot Head on a trail made up of nearly 1,500 pink granite steps (interpret that last word loosely…). At the bottom, we would trot a short three miles along the Park Loop Road to get back to our car. It all sounded amazing, but I needed to get past The Beehive to enjoy the rest. “Just keep going and don’t look down,” was my mantra for the first hour of the day. Even near the bottom of The Beehive, we had to use iron rungs secured into the rocks to get from one ledge of the trail to the next. A little further up, we resorted to crawling over a series of iron bars laid out like a ladder across a 20-foot drop. The two most difficult spots included a double series of iron bars that brought us almost straight up a rocky patch about 300 feet into the climb and a corner that required the use of one iron rung to scoot around it while stepping over a gap in the cliff’s edge. This entry was posted on May 12, 2012 by Words Per Gallon. 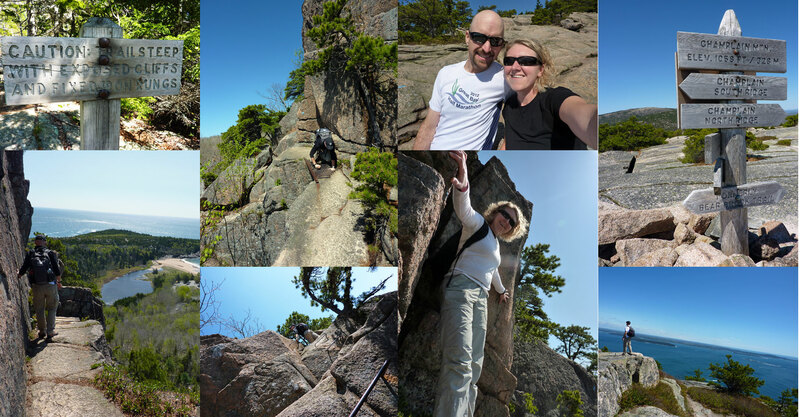 It was filed under Hiking, National Parks and was tagged with Acadia, Champlain Mountain, Fear of Heights, hiking, Huguenot Head, National Park, The Beehive, The Precipice. Thanks, Mo. It was a crazy experience. We needed all out strength and focus to make it up there safely. The one picture with the person on their hands and knees crossing a “bridge”. Is that just a ladder spanning a gap? That’s a crazy trail and would love to try it. For someone with an anxiety of heights you’ve done well. Great write up and photos. Thanks for reading. It was definitely an experience. That “ladder” is a series of iron rungs drilled into the side of the cliff to help get over a decent-sized gap. A braver person could probably walk across them, but we were a little leery of doing that, as there’s nothing but air to the other side! Marty, I told you to never play in dangerous places 🙂 . That goes for you too, Jen !!! You both are brave souls.